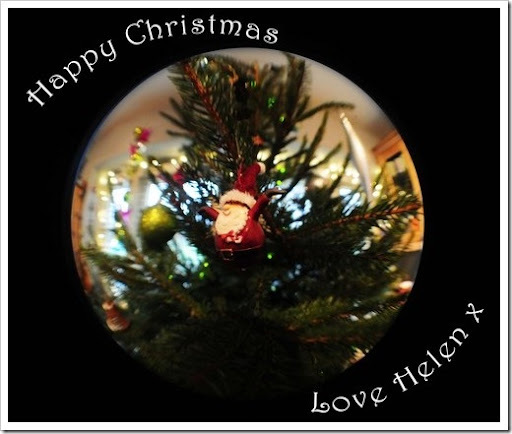 Happy Yule & Midwinter Solstice to everyone! I’m pleased to be across the solstice and back to days where the sunlight is returning. 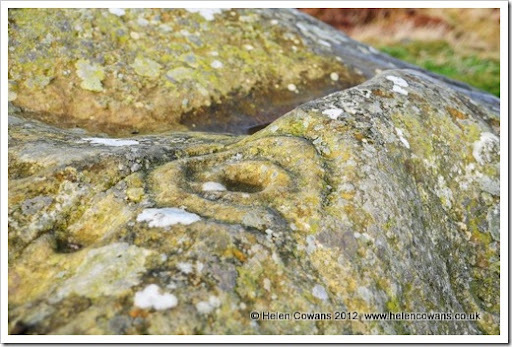 There were no walks to carved rocks or photos of the sun shining through the trees this year. Its not stopped raining for weeks (so it seems) and the sun hasn’t been out to play for a while. In preparation for the holidays I’ve ignored the house, but have written all the cards, purchased presents and wrapped everything in hand printed wrapping paper (the Indian printing blocks are wonderful for this). 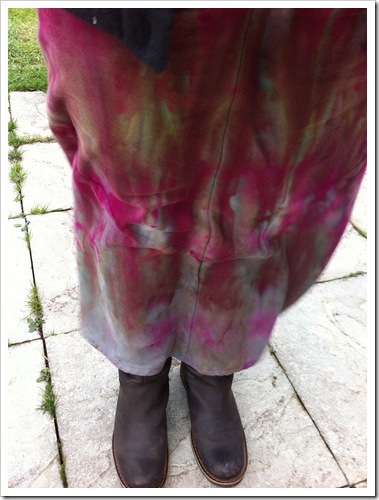 As a displacement activity I’ve made two skirts from tablecloths and then procion dyed them. Excuse the quality of the picture – taken on the phone on a very windy day. 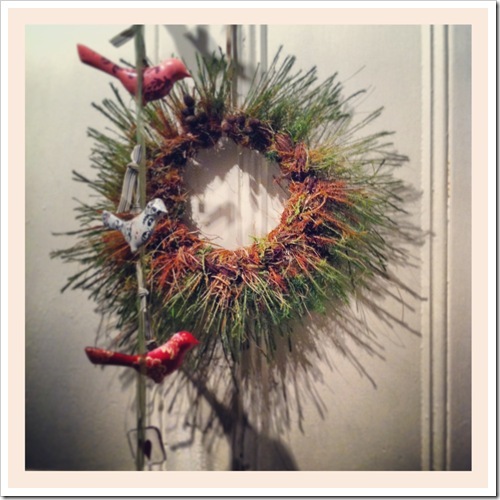 Yesterday I made my first ever wreath – using moss. Paula’s wreath was very neat and tidy, mine is wild and shaggy! If it wasn’t raining so hard I’d be out collecting more moss and making more of these, lovely to use my hands in a different way and to make more practical items. 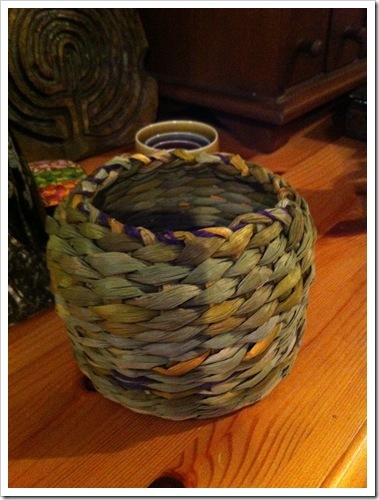 Below is a photo of a rush pot I made a few weeks ago on a workshop at Etal– I added purple hemp thread for some contrasting colour. It was a lovely day out meeting new people. 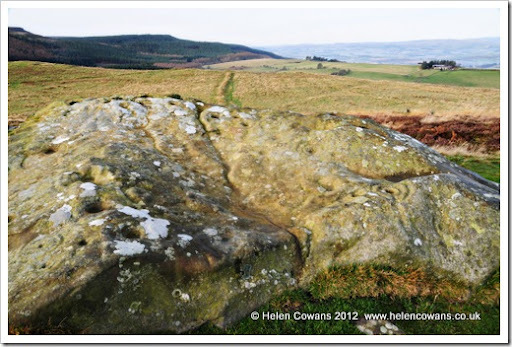 Near Rothbury, a special place for many reasons, not least because its the place were we got engaged. 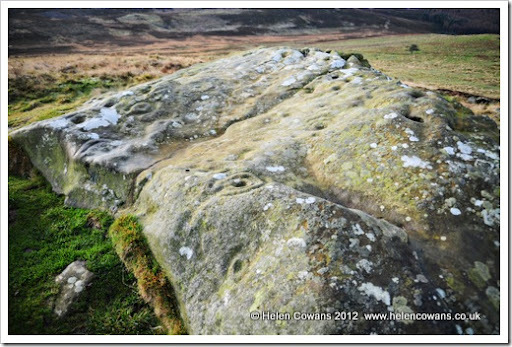 This is the most spectacular rock on the site (there are several others). Rugged beauty of the land combined with art and mystery. 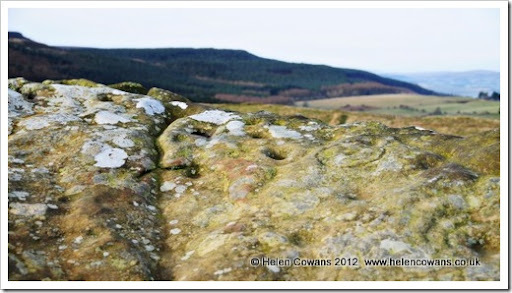 Looking towards Simonside from the Hill Fort. 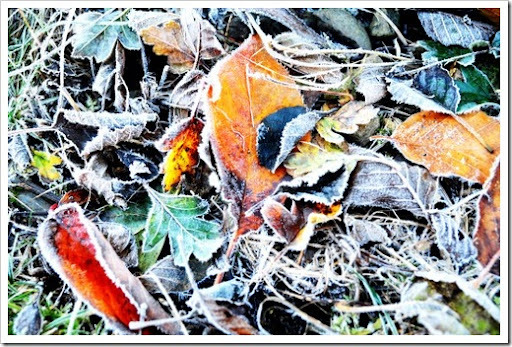 When I was a little girl I believed utterly and truly in Jack Frost. More than the Tooth Fairy, more even than Santa (well Jack Frost came more often). Mother Natures Earth Magic at work in the garden. In glorious Technicolour for the hit of yellows / oranges / greens / browns. B&W for the forms and shapes. 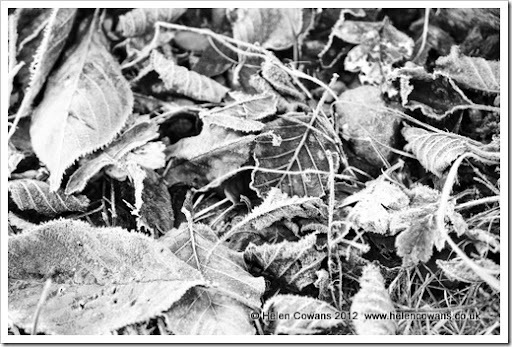 Hidden worlds under the leaves. As the MA in Archaeology is on hold for now I’ve signed up for another Oxford University course “Islamic Art & Architecture”. Basin, Turkey, probably Iznik. 1545. So looking forward to the start in mid-January. • Introduction and a starting point. • Muslim places of worship and devotion. • Calligraphy and arts of the Qur’an. • Painting and figural representation in Islam. 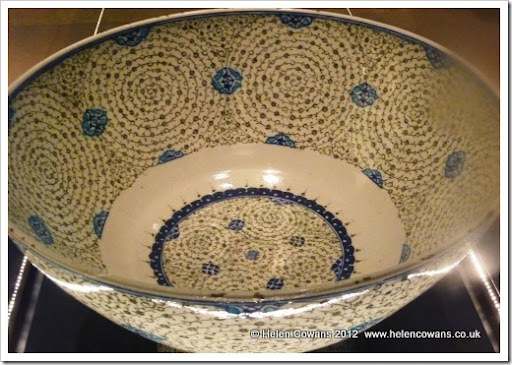 • Ceramics of the Muslim world. • Islamic ornament: Geometry, Arabesque and Calligraphy. • Arts of the book: Painted and illuminated manuscripts. • Funerary landscape: tombs, mausoleums, and gardens. Lots to do before January though! 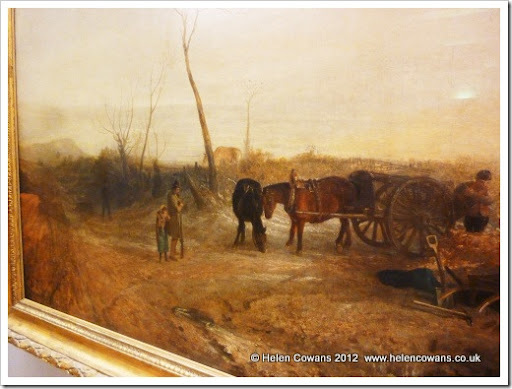 London Part 4 – Tate Britain. A first ever visit to Tate Britain was the afternoon activity. I was in heaven with the main exhibition. More information here and here. When I walked into the room of Burne-Jones paintings I audibly gasped out loud. 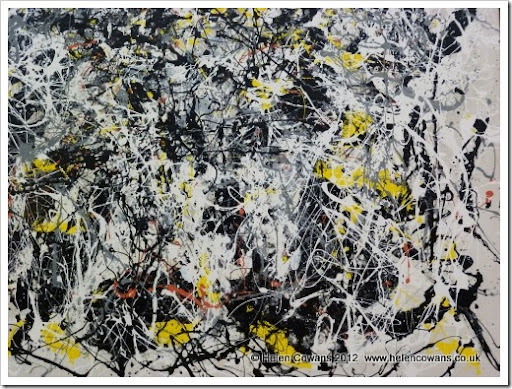 He’s my favourite painter and has been for many, many years. I love many styles and many artists work, but only BJ makes my spine tingle, my eyes widen and my jaw drop (I swear I did this too). The detail on this dress was stunning. Go look it up on Googleartproject and zoom in (see below). Ah yes, don’t we know that feeling of a stiff back and neck after sewing? Love among the ruins. Burne-Jones. Am looking into getting a large poster of this work for the studio / bedroom. 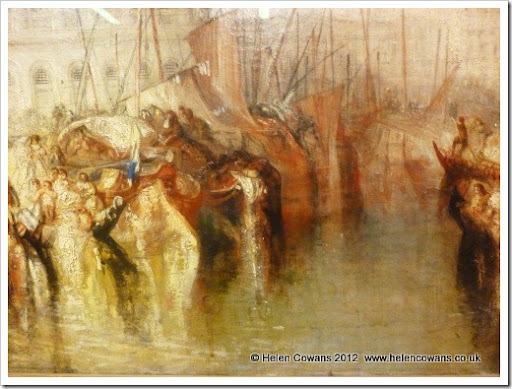 Other images at the Tate Britain were wonderful too – many of which I hadn’t seen before. Tacita Dean. Majesty 2006. 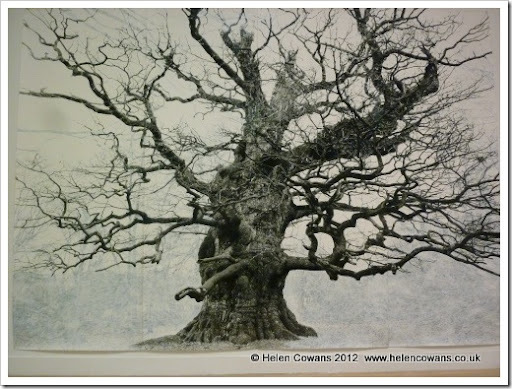 Gouache and photograph mounted on paper. 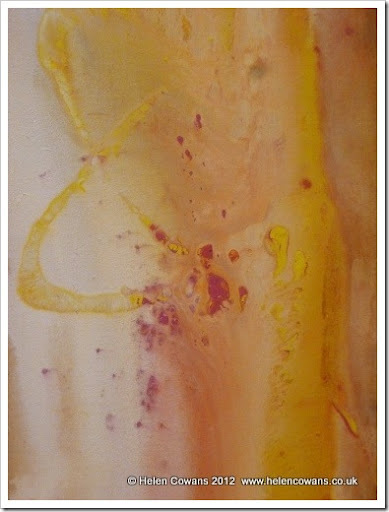 Frank Bowling. Detail of Pandora’s Box I. 1974. Acrylic on canvas. A random mess, but not, at the same time. Whistler. Detail of Crespuscle in flesh colour and green: Valparaiso. 1866. Despite the unwieldy title I was drawn to the very ethereal colours. 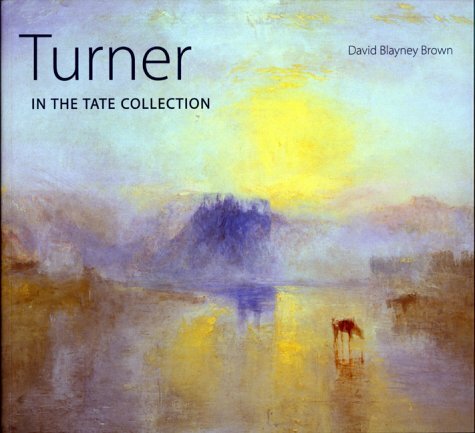 When you visit Tate Britain you can’t ignore Turner. My good friend had advised me spend time in the Turner galleries and print room and I can honestly say I was utterly blown away. 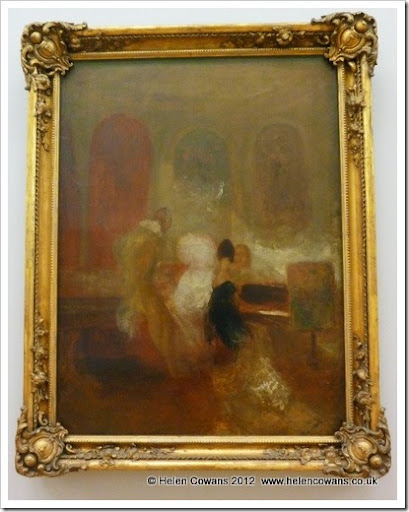 Have seen Turner’s work in 2011 in the annual exhibition in Edinburgh. But the work in the Tate was so varied and so ……wonderful (have I used that word too much in this post? Probably). 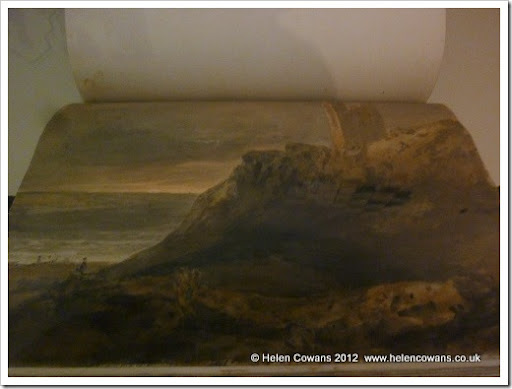 Turner made several drawings and paintings in Northumberland. 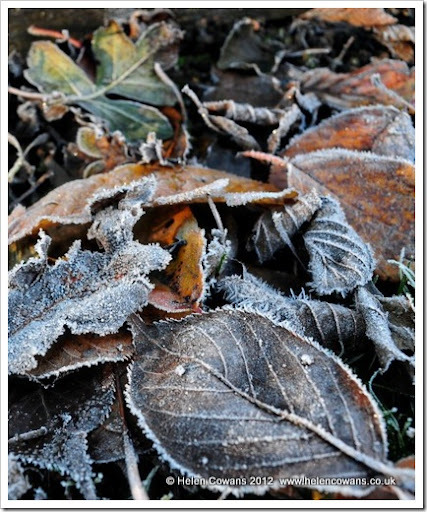 Norham is very close to home, making it all the more special. Dunstanburgh Castle: The Lilburn Tower at Sunrise. 1797. From Turners North of England Sketchbook. This might not look very interesting, but it was! 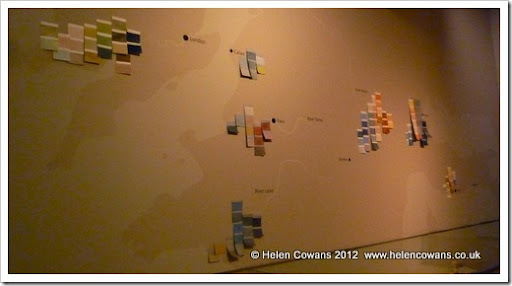 Its a wall, with a map of Europe showing how the colour palette Turner used changed with his travels. More information and a better photograph here. I stopped and listened to a gallery talk and was amazed at how much I learnt in 10 minutes. 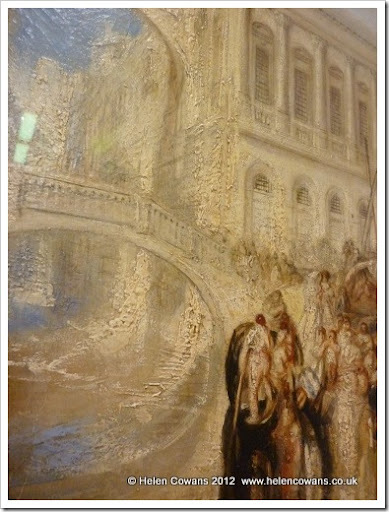 War in Europe stopped a “grand tour” when Turner was younger, however when he did start to travel his work changed immensely. 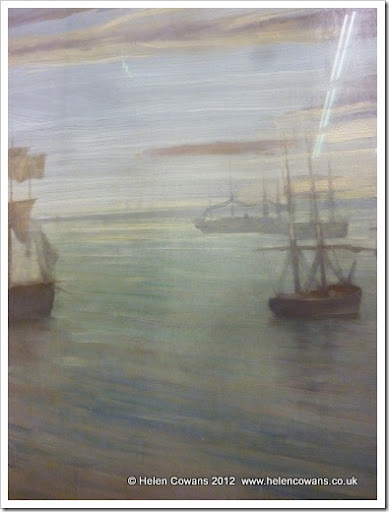 The main features being “yellow” (Turner started to use a lot of yellow to bring light and warmth to his paintings) and “perspective” which he used very successfully to draw the viewer right into the picture. 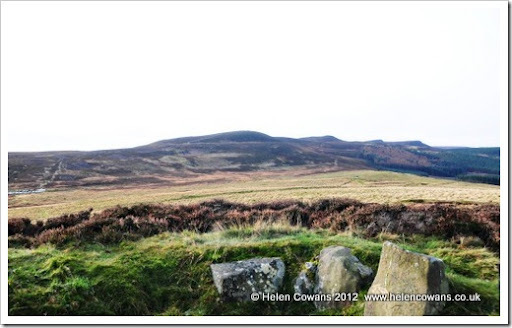 I tried to capture this with the photo below, where you can almost step into the picture and walk along the lane. Turner. Music Party, East Cowes Castle. c.1835. This is an unfinished canvas but I loved the atmosphere and colours. Something in it just clicked with me. Details….. I loved the details and the figures that were there, but weren’t there. Details only suggested, but also visible. A book landed on my doorstep not long after I arrived home. I caught the 17.00 train from Kings Cross > Berwick Upon Tweed where DS and DH collected me and drove me home; one exhausted, but very happy and inspired stay-at-home mummy/artist/tutor/ex-biologist! Did I really cover all that ground from the 11.55am arrival in London on Friday to leaving at 5pm on Saturday? Can’t wait to to do all again in the spring.